Nursery Rhymes Posters (6) b/w to read and decorate. Baa Baa Black Sheep nursery rhyme printable. Wee Willie Winkie nursery rhyme printable. Daffy Down Dilly nursery rhyme printable. Diddle Diddle Dumpling nursery rhyme printable. Hey Diddle Diddle nursery rhyme printable. Humpty Dumpty nursery rhyme printable. Jack and Jill nursery rhyme printable. Twinkle Twinkle nursery rhyme printable. Mary Had a Little Lamb nursery rhyme printable. Mary Mary Quite Contrary nursery rhyme printable. Two nursery rhymes foldable booklets – Jack and Jill, and Baa Baa Black Sheep - this is a sample from the Nursery Rhymes 20 Foldable Booklets set. NURSERY RHYMES Theme Pack for Preschool 127 pages. 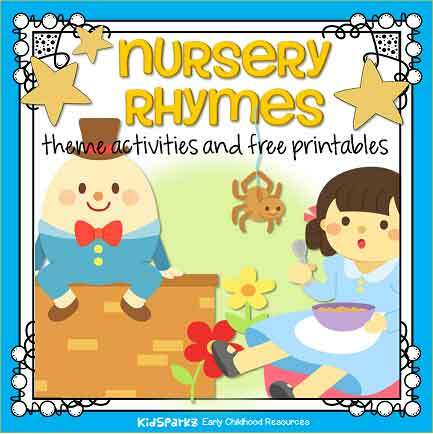 This is a comprehensive set of printables with a Nursery Rhymes theme. $7.50. This is a collection of 48 favorite finger plays and action rhymes for early learners, each of them with an added cut-out activity to extend the learning and fun. 126 pages. FREE to MEMBERS, on the Nursery Rhyme theme page. Old MacDonald Had A Farm activities, centers and printables. $4 Free to MEMBERS in the Member Library.